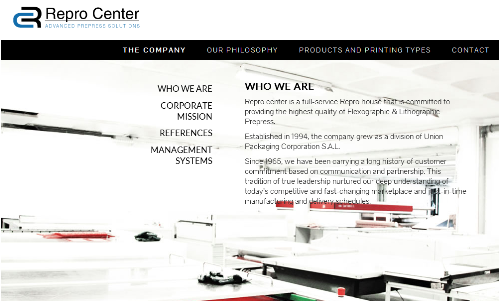 Visit www.reprocenterlb.com to learn more about Repro Center and its top-of-the-line printing services. Repro Center, a division of Unipak, offers customers and prospects a visual and appealing website. The new website features information about Repro Center’s wide array of products and services. The full-service repro house offers flexographic and lithographic prepress printing, pre-mounted polymer plates, photopolymer flexographic printing plates, as well as consulting and process analysis. Repro Center provides color management services, color separation services, as well as proofs to ensure accuracy and precision. The website shares Repro Center’s philosophy to ensure premium products and services while upholding to corporate social responsibility. The repro house adheres to top international quality management systems requirements (ISO 9001:2008). Repro Center is a division of Unipak, a member of the multinational INDEVCO Group.